Background: Surgical skills training is becoming an integral part of general surgery residency programs. While the RRC and ACGME require access to a skills training laboratory, and the ACS and APDS offer a surgical skills curriculum template, there is no consensus as to what comprises a mandatory curriculum. The TASKit portable laparoscopic simulator (Cincinnati, OH) was offered to PGY-1’s of surgical residencies in 2008 as part of an industry-sponsored grant program. There is no validated curriculum designed for the TASKit. In order to investigate the scope of TASKit’s utilization and value to a surgical training program, survey data was gathered regarding frequency of use and user impressions of the box trainer across all PGY levels. 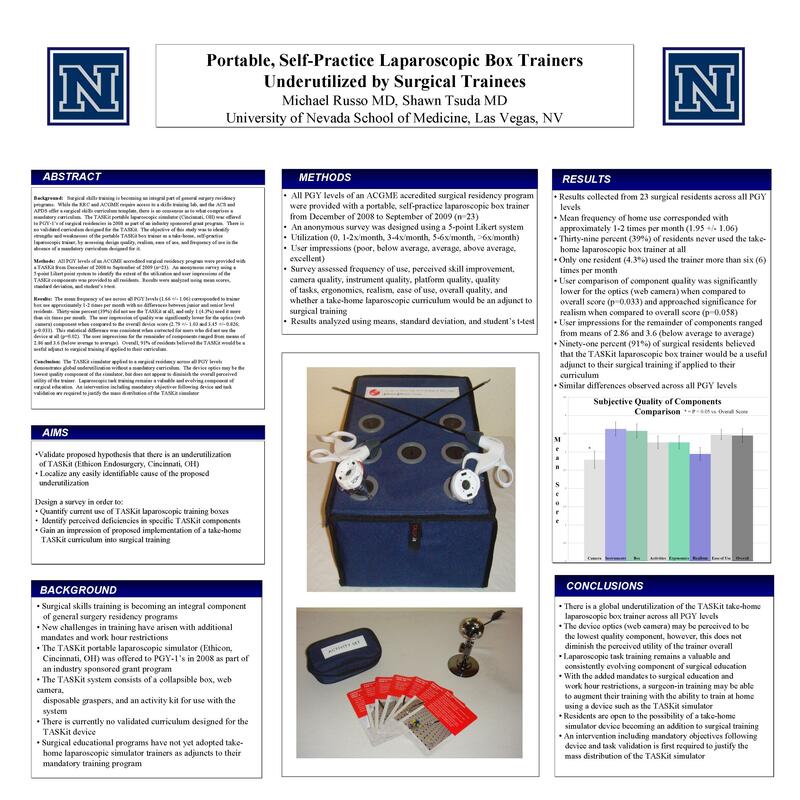 The objective of this study was to identify strengths and weaknesses of the portable TASKit box trainer as a take-home, self-practice laparoscopic trainer, by assessing design quality, realism, ease of use, and frequency of use in the absence of a mandatory curriculum designed for it. Methods: All PGY levels of an ACGME accredited surgical residency program were provided with a portable, self-practice laparoscopic box trainer from December of 2008 to September of 2009 (n=23). An anonymous survey using a 5-point Likert point system (0, 1-2 x/month, 3-4x/month, 5-6x/month, >6x/month) to identify the extent of the utilization and user impressions (poor, below average, average, above average, excellent) of the TASKit was provided to all residents. The survey assessed perceived skill improvement, camera quality, instrument quality, platform quality, quality of tasks, ergonomics, realism, ease-of-use, and frequency of TASKit use. Results were analyzed using mean scores, standard deviation, and student’s t-test. Results: The mean frequency of use across all PGY levels (1.66 +/- 1.06) corresponded to trainer box use approximately 0-2 times per month with no differences between junior and senior level residents. Thirty-nine percent did not use the TASKit at all, and only 1 (4.3%) used it more than six times per month. The user impression of quality was significantly lower for the optics (web camera) component when compared to the overall device score (2.79 +/- 1.03 and 3.45 +/- 0.826; p=0.033). This statistical difference was consistent when corrected for users who did not use the device at all (p=0.02). The user impressions for the remainder of components ranged from means of 2.86 and 3.6 (below average to above average). Overall, 91% of residents believed the TASKit would be a useful adjunct to surgical training if applied to their curriculum. Conclusion: The TASKit simulator applied to a surgical residency across all PGY levels demonstrates global underutilization without a mandatory curriculum. The device optics may be the lowest quality component of the simulator, but does not appear to diminish the overall perceived utility of the trainer. Laparoscopic task training remains a valuable and evolving component of surgical education. An intervention including mandatory objectives following device and task validation are required to justify the mass distribution of the TASKit simulator.